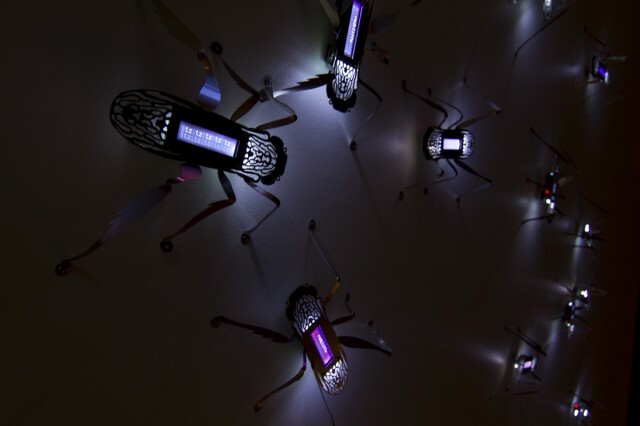 This silent swarm of stylized crickets is downloading data from Internet and catalogue searches being undertaken by the public at the State Library Queensland. These searches are being displayed on the screen on their backs. 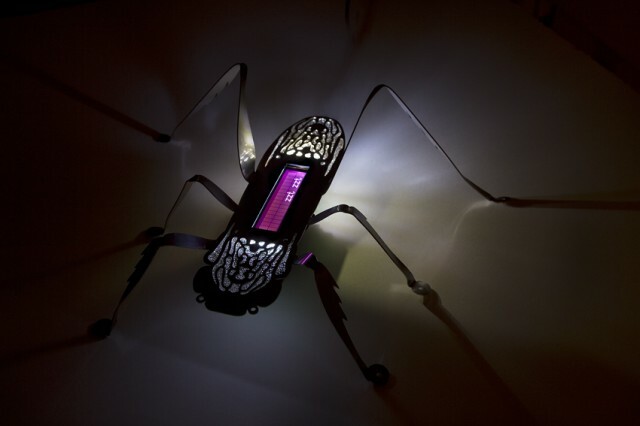 Each cricket downloads the searches and communicates this information with other crickets. Commonly found searches spread like a meme through the swarm. In this work memes replace the crickets’ song, washing like a wave through the swarm and changing on the whim of Internet users. 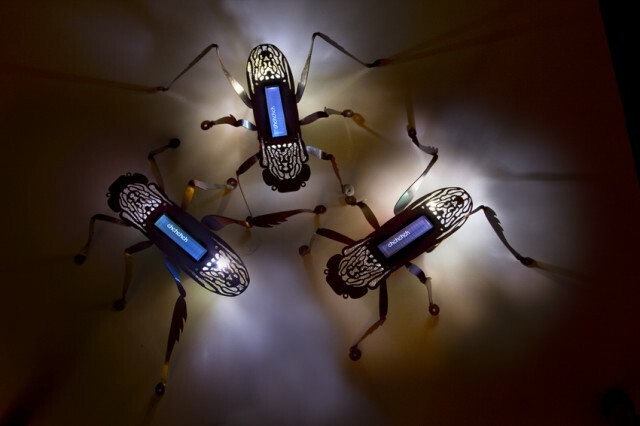 When one cricket begins calling others, the swarm may respond to produce emergent patterns of text. When traffic is slow or of now interest to the crickets, they display onomatopoeia. The work is inspired by R. Murray Schafer’s research into acoustic ecologies. In the 1960’s Schafer proposed that many species develop calls that fit niches within their acoustic environment. An increasing background of white noise dominates the acoustic environment of urban human habitats, leaving few acoustic niches for other species to communicate. The popularity of headphones and portable music may be seen as an evolution of our acoustic ecology driven by our desire to hear expressive, meaningful sound, above the din of our cities. Similarly, the crickets in this work are hypothetical creatures that have evolved to survive in a noisy human environment. 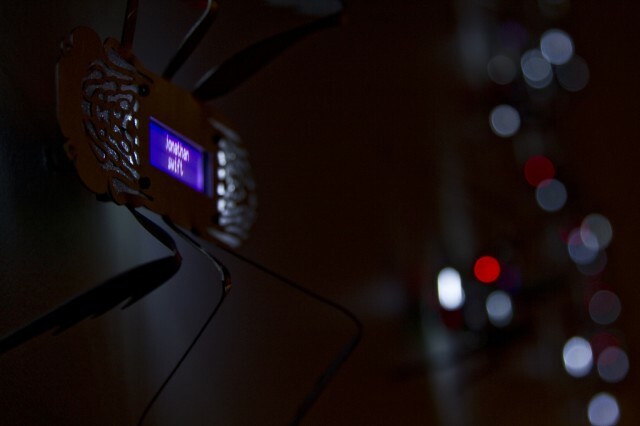 This speculative species replaces auditory calls with onomatopoeia and information memes, communicating with the swarm via radio frequency chirps instead of sound. 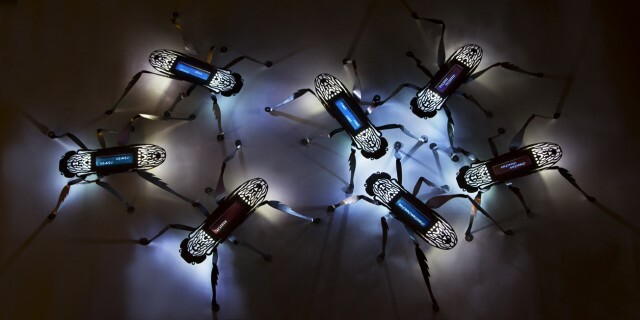 Whilst these crickets cannot make sound, each individual has been programmed respond to sound generated by the audience, by making onomatopoeia calls in text. Try talking to a cricket, blowing on its tail, or making other sounds to trigger a call. 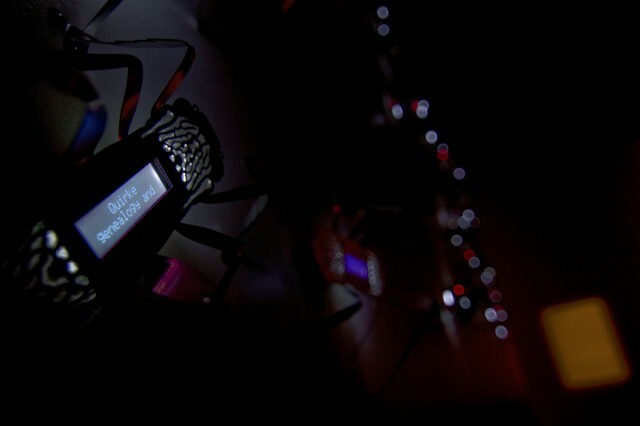 UNCONTAINABLE & Untitled Exhibition at the International Symposium of Electronic Art Istanbul 2011. An Official Parallel Program of the 12th Istanbul Biennial. 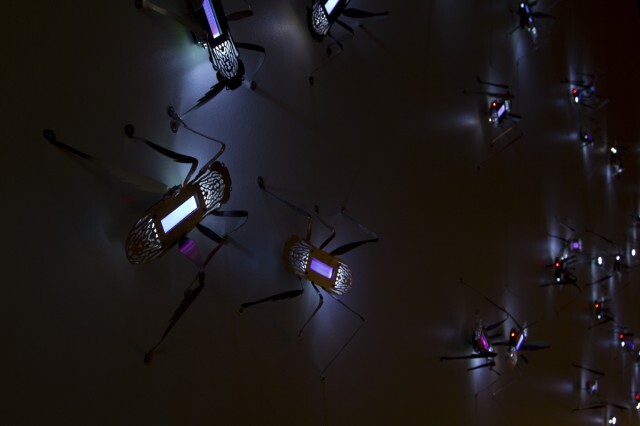 LUMIA :: art/light/motion, at the State Library of Queensland, April 9 to June 5 2011. Sade, Gavin J., Bracks, Priscilla. Suzumushi: The Silent Swarm. ISEA2011 Uncontainable, Leonardo Electronic Almanac, Volume 18 Issue 5. Sade, Gavin J. Suzumushi: a silent future. In the Proceedings of the International Symposium of Electronic Arts 2011. Sade, Gavin J., Bracks, Priscilla, Brown, Paul, Carroli, Linda, & Takeifanga, Naomi (2011) Lumia : Art | light | motion. The Art of Kuuki. State Library of Queensland, Brisbane, Qld. This project has received financial assistance from the Queensland Government through Arts Queensland. The project is also supported by the Creative Industries Faculty of the Queensland University of Technology.